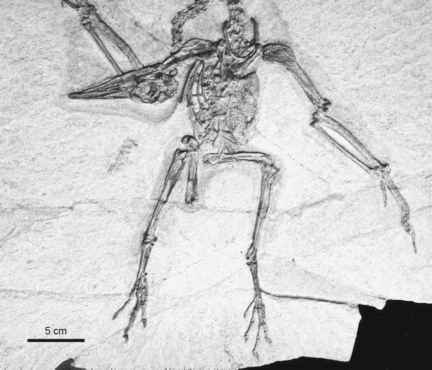 Protocypselomorphus manfredkelleri Mayr, 2005 is represented by a single skeleton from Messel (Mayr 2005f). The species is similar in overall size to the extant Common Swift (Apus apus), and also has a short, swift-like beak. Whereas, however, the forearm (carpometacarpus and distal phalanges) is very long as in apodiform birds, the humerus is not shortened. The sternum is elongate with a strongly cranially protruding sternal carina. The short tarsometatarsus is only one third of the length of the ulna. P. manfredkelleri agrees with the Steatornithidae but differs from all taxa included in this chapter in the plesiomorphic presence of 19 or 20 presacral vertebrae. The combination of a short, swift-like beak with long wings and short feet indicates that the species hawked insects on the wing. A phylogenetic analysis placed it as the sister taxon of the Cypselomorphae (Mayr 2005f), but still more data on the morphology of P manfredkelleri have to be gathered for a strongly based classification.